A New Zealand Government organisation called Learning Media asked me a while ago if they could use one of my crocodile photos in a children’s book and I said that would be fine. Well not only did they use it, but they chose it as the cover image and featured it again on page 4!! 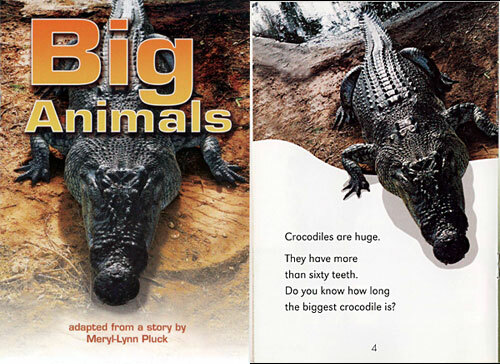 The book is called “Big Animals” and is part of a package used in school intervention programs for struggling readers and English language learners. This book series has been proven to increase reading achievement in students reading below the average level for their school year. I’ve scanned a copy of the cover and page 4 of the book below so you can see what it looks like. Well done Neerav. Great photo! Congratulations! Some of your wildlife photos are a little more up close and personal than most people feel comfortable with, so it’s good to see you getting some recognition for it. Congrats mate!! its good to know that ur pictures are on children book. Good luck. I thought that would be a bit to scary for a kids book lol. Congratulations, it’s always nice to receive such recognition especially considering picture was used for good cause. actually, putting the crocs on display is a great idea. the way crocs have been painted as very fearsome creatures, the students would get to see the crocs in a very graphical manner. nice article. I think it is great for kids to have pictures and books on animals that are usually feared. It shows why they do what they do. I think kids and adults always like explanations for everything. This is a great photo. I’m glad to see that your hard work is paying off, hopefully soon you’ll get more offers like this leading to great oppurtunities. Good Luck! That is great. That is a win-win for you and for them as they have a nice cover and it is used for a good cause.